Wedding Cake Cheeses are becoming increasingly popular for good reason. They are proving to be an economic and stylish alternative to a traditional sweet fruit wedding cake. They look great, being entirely natural, showing off their own stylish colours and wonderful textures. They taste even better! Many wedding parties find that they are making a great addition either as a cheese course or even as the centrepiece for an evening event. They are perfect with wine, beer and cider and hungry guests will delight in a substantial feast along with chutneys, pickles and a selection of crackers to complement. 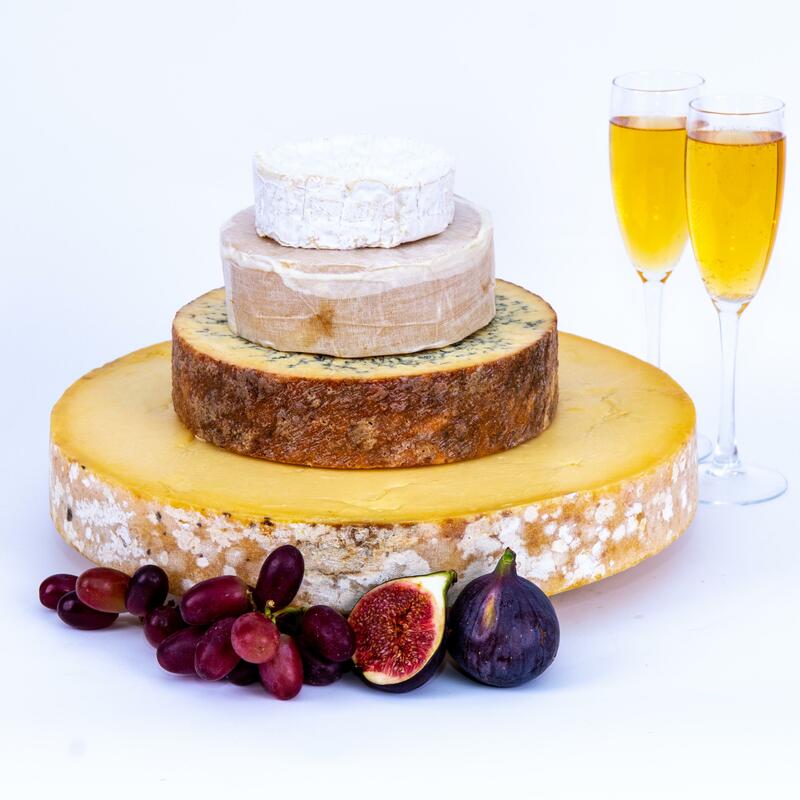 Celebration Cheese Cakes are not just for weddings – they are perfect for all celebrations such as graduations, birthdays, anniversaries and Christenings. Our whole cheeses are approximately 13 inches in diameter (330mm). We would cut to whatever you require- anything from 1 inch/25mm deep (around 2.9Kg) to 4 inches/102mm deep (around 11.4Kg). You may even select the age of the cheddar used so that you determine the strength of flavour. We also sell other British guest cheeses in our shop in Cheddar such as Blue Stilton, Yarg and Shropshire Blue so are happy to provide more than just cheddar cheese rings if you wish. Please call us on 01934 742810, we will be very happy to discuss this further if you are interested. We need a little notice to select, prepare and cut the cheese for you, so ask for at least two weeks notice for this service. What does a Cheese Cake involve? Basically, it is made up of tiers of different cheeses. As in a traditional cake, the tiers get smaller towards the top. You can have two, three, four or more layers, each one being a different cheese. Many Cheese Cakes start with a substantial base of a cheddar ring, cut from a large truckle. Building on this you can arrange your tiers stacked directly, or place risers and supports between the layers. You might complement colours and textures using a Shropshire Blue, a Cornish Yarg or even a classic Somerset Brie. The Cheese Cake can be decorated to fit in with your theme and mounted on a wooden board, or even a slate. Let your imagination fly! Why ‘The Cheddar Gorge Cheese Co’? We are the proud makers of authentic handmade award-winning cheddar, the UK’s most popular and best-loved cheese. 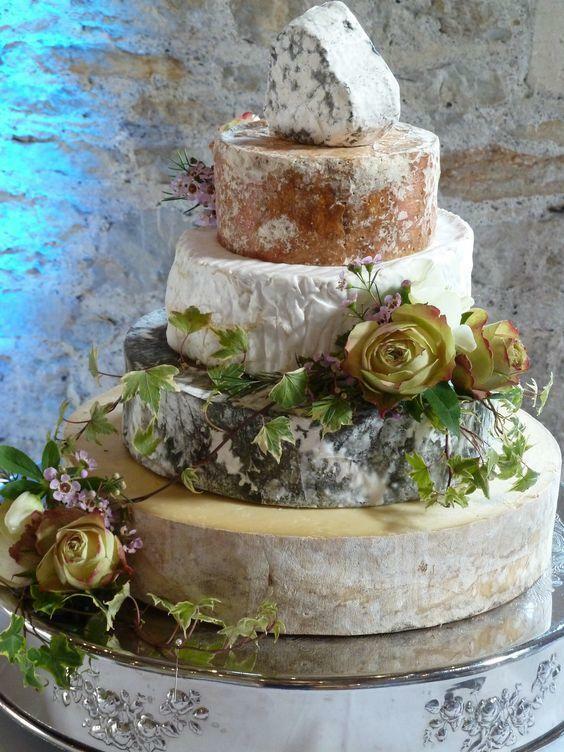 We can offer you a choice from our classic range of Cheddars (from Mellow to Classic Vintage or Cave) to form the base and foundation of your Wedding Cheese Cake. We’ll select and cut the wheel to order for you. You will know that you have simply the best. We can offer you a proven choice of other tasty cheeses for balance and variety. As we have been making and providing Wedding Cheese Cakes for many years, we know what works and we will provide you with a memorable tasty talking point for years to come! You should estimate between 50g – 100g per guest. 50g-70g is a good guide if your Cheese Cake is being enjoyed as a cheeseboard course. Use the higher figure if your Cheese Cake is the centre of your spread or buffet. How soon should I order and how will my Cheese Cake be delivered? You can order as far in advance as you wish! Ideally, we need a minimum of two weeks notice for our truckles, and three weeks if we are supplying complementary layers of other cheeses such a brie or Stilton. We will happily talk you through the order and give you an outline price which you pay in advance. Once the final cut is made we will adjust the price accordingly. We will package your cheeses using environmentally friendly materials, along with ice packs to keep your cheeses cool. We send via DPD using a tracked courier system with text notification. We time your cheese to arrive two days before the event. We can deliver to a home address or to a venue. How do I look after my Cheese Cake and how should it be presented? Each cheese should be refrigerated until the big day. You assemble in situ, either stacking the cheeses directly or using separators or tier stands to create extra height. You simply unwrap the cheese, assemble and decorate. The decoration you choose is entirely up to you, but we think simplicity is the best. The cheeses look delightful and stunning on their own and make a great talking point. The simple use of fruit such as grapes or even figs, for example, can provide a lovely compliment. You may wish to incorporate flowers or decorations to fit in with your wedding theme. Your florist will be able to advise you. Ordering your Wedding Cheese Rings. Our whole truckles of cheddar weigh in at around 25kg to 28 kg however, we can cut a “slice” of Cheddar from any one of our whole truckles of cheese to any depth you require. The diameter will always be approximately 330mm (13"). We can offer you Mellow, Cave Matured or Vintage. Please see our tasting notes for further details. All of these are award-winning cheddars – and they are striking in taste and looks. 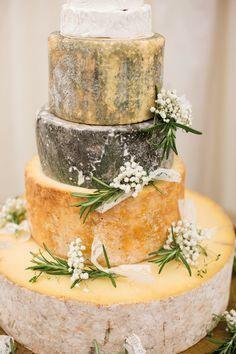 Stilton, Shropshire Blue, Cornish Yarg, Somerset Brie are also available to build up the tiers. The diameters are set out below. Most Celebration Cheese Cakes follow the traditional tier system with smaller cheeses on top and customers have the option of ordering more of the smaller cheeses, so nobody misses out on the selection! All our cheddars are suitable for Vegetarians. We can try and source guest vegetarian cheeses where possible.